Gucci launched Flora in 2009. Flora is one of those light and sparkling casual florals, pretty and inoffensive — you know the sort I mean, the kind that go for pleasant and wearable over interesting, but that so perfectly hit that "pleasant and wearable" mark that they're memorable anyway. When I reviewed it, I called it the still-cheerful older sister of Marc Jacobs Daisy, if that helps you place it. And like Daisy, it was just a notch above the competition. I often recommend it to people who are looking for something in that genre. 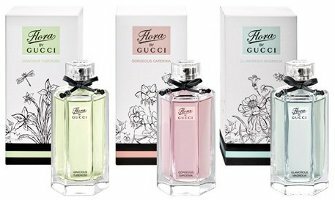 Gucci's new Flora by Gucci The Garden is a quintet of floral flankers. Two of them — Generous Violet and Glorious Mandarin — are in limited distribution, and I have not tried them.1 The other three — Gorgeous Gardenia, Gracious Tuberose and Glamorous Magnolia — are widely available in department and beauty stores, and those are the three I'm reviewing today. All of them, like the original Flora, were reportedly inspired by Gucci's "renowned" Flora print. Gorgeous Gardenia (pink bottle) is a fruity blended floral, with a huge dollop of sugar (the notes: red berries, pear, gardenia, frangipani, patchouli and brown sugar accord). It might have some gardenia, but it sure doesn't have much, not even in the opening where you might most expect to find it. It quickly settles into a light and vague almost-fruitchouli of no particular distinction. I'm a huge gardenia fan, and as huge gardenia fans know, a good gardenia is hard to find. I didn't really expect to find it here, but I thought it might at least be a gardenia in the Flora mold: light, sparkling, pretty and clean. Nope. I vastly prefer the original Flora. Glamorous Magnolia (blue bottle) is the one I was most interested in, decent magnolia fragrances being even harder to come by than decent gardenia fragrances. This one does smell more like magnolia than Gorgeous Gardenia smells like gardenia, but the freesia and peony are also fighting for prominence. It's one of those fragrances that feels simultaneously sheer (it is not heavy or deep) and loud (it's awfully diffusive), and there's a strong undertone of something green and watery and cucumber-ish (the notes: freesia, green leaves, citrus zest, peony, magnolia, musk, sandalwood and warm chocolate accord). The green stuff mingling with the light — but not light enough for me — chocolate accord did not make me especially happy; I tried to give it a second chance but ended up washing it off. I like this one even less than the Gorgeous Gardenia. Gracious Tuberose (green bottle) really is a tuberose fragrance. Not a brilliant one, mind you — tuberose fiends are not likely to be impressed — but it's really about what you'd expect from a tuberose flanker to Flora. It's light and sparkling and clean and pleasant. It opens fruity and somewhat sweet, and it has a pale woody musky dry down (the notes: violet leaves, peach, orange flower, rose, cistus, rock rose and white cedar wood). It smells less like tuberose and more like "flowers" the longer it's on skin, and it does not smell like anyone made any huge investment in the materials, but it's fine, and it's far and away my favorite of the three. That said, I'd still rather wear the original Flora. Flora is a reasonably good example of its kind; Gracious Tuberose cannot hope to compete with other tuberose fragrances, even light and clean and pleasant tuberose fragrances. Verdict: I did not have huge expectations, but even then, these were a disappointment. They're exactly the sort of flankers that give flankers a bad name. The quick poll: name a decent gardenia, magnolia or tuberose fragrance that can be had for less than the $70 they're asking for these. Gucci Flora The Garden Gorgeous Gardenia, Gracious Tuberose and Glamorous Magnolia are available in 50 and 100 ml Eau de Toilette. ($70 / $100). Matching body lotions are also available. 1. I think they're just at Gucci boutiques? If anyone has tried them, do comment. Do Son is a nicely done light tuberose that costs right around $70. I’m really interested in what will be suggested for gardenia, which is hard to do well at any price. Totally agree with Diptyque Do Son — perfect example. Good one! I’m very fond of Do Son. The now sadly discontinued Tom Ford Black Orchid Voile de Fleur can still be had for a song at discounters and is genuinely GOOD. EL PC Tuberose Gardenia is a little more than that but it’s still pretty well-priced. VdF is discontinued??? Bummer. You bet I’m going to stock up. I didn’t know that either. Although now can’t remember if it was a limited edition in the 1st place? My experience has been that VdF turns “off” after a few years like a lot of ELs, regardless of light exposure. I’m afraid to stock up which is a shame because it’s a really great tuberose. Yup, believe it’s been discontinued. I even checked their website and it’s not there. Voile de Fleur is a favorite of mine (and I’m a total tuberose sucker). I always liked it (more so than the original BO), thought it was nicely done and deserved to get a lot more love than it did. BO VdF is a favorite of mine too – and my hubbie even likes it. It is discontinued. There are still bottles at fragrance net last time I looked. At Sephora, an ounce of Fracas EDP is but $45. And an ounce of Fracas will go a long way. Now that I think about it, I realize that I have never smelled either a gardenia or a magnolia frag! My favorite cheap tuberose perfume is Guerlain’s Mahora, mainly because it is soft, gentle, and not overwhelming! Seriously, no gardenia, ever? Magnolia is easy enough to avoid, there are so few of them. I always enjoy reading your reviews, even if I have no interest whatsoever in the fragrance. No gardenia that I’m aware of. I’ve learned over the years that soft florals with a musk base are my least favorite scents. Aw, that’s sweet, thank you. My favorite magnolia fragrance that can be found under $70 (if a little shopping around isn’t an issue) is L’Instant by Guerlain. I have the edp, but the edt falls well under that price range, I think. It is rich, sweet and like a blossom dipped in honey and sprinkled with a little citrus, but it is just beautiful and so easy to wear. Seconded on the EL Tuberose Gardenia and Fracas, too. Both of those are lovely. Oh, and you can get a purse spray of Mary Greenwell Plum which, to my nose, has a lot of tuberose in it for well under that price and it is stunning. Even though the three Floras you reviewed left you less than impressed, Robin, I’d be curious to try the mandarin and violet interpretations, too, and didn’t even know those existed. I was curious about them until I smelled these, now I’m admittedly far less so. Even if they’re slightly better, they wouldn’t be worth hunting down. The new Truth or Dare from Madonna is to my nose a lighter version of Fracas. I think it’s around $55.00 for 1.7 fl. oz. bottle. Good call — and I’m reviewing that on Thursday. Looking forward to your review, Robin. I will be interested to smell that one. Thanks for the review, Robin. It is so true that a good gardenia fragrance is hard to find and every time I try something new to me, I am almost always disappointed. It is a difficult scent to capture and I haven’t found one that truly captures its heady scent. Gardenia fragrances or interpretations of it that I love, which come close to the real gardenia are, PG Gardenia Grand Soir and Isabey Gardenia. I smelt a real magnolia flower the other day and it had a subtle scent. It’s not very sweet or heady, but has an almost medicinal scent. I think I’ll try Glamorous Magnolia just to see if it smells anything like the real flower. The original Isabey (have not smelled it recently) was really a great scent, but I always thought it too expensive…but still. Regret I don’t have some, and wonder if it’s been reformulated to death. A decent gardenia under $70 that I can think of is AG Gardenia Passion. I need to smell that one again. I love AG Gardénia Passion. But according to both The Guide and BoisdeJasmin, it is not a gardenia, but a green tuberose. Gorgeous scent either way. Most gardenias end up being mostly something else (Chanel’s is mostly jasmine). Victoria said the same in her review of Guerlain’s Cruel Gardenia. I suppose it is because you can only do a reconstruction. The Lauder is apparently closer to a real Gardenia; I couldn’t possibly say, having never smelled the actual flower. I get tuberose from AG Gardenia Passion too. I see that there’s no need for me to register an entry for AG Gardenia Passion, definitely one of my HGs. Not a true gardenia but more dominated by the tuberose, so it qualifies as my favorite affordable (sheer) tuberose, alongside Mahora (as mentioned by Rapple above), which, thanks to the frangipani, is on the “rich” end of the spectrum. I love kai, it’s simple and for the prizes you can even get some linen sprays and candles for less then $70.00 too. I love Kai too — simple & direct, reasonably cheap. I was just thinking Kai – it’s great! In a word, no. No to these. I sampled these the other day. I wanted to like them..I think I liked the Magnolia the most..but was just too sweet and I wanted more magnolia. I kind of liked the Gardenia as it wasn’t too much of gardenia, lol. But the dry down wasn’t something I liked at all. And tuberose.., not a fan of tuberose much. But I do believe the Tuberose was the most spot on scent as to capturing the flower. But sure there are better Tuberose scents out there. I wanted the Magnolia to be a good one..I need a good magnolia!:). +1 on sticking with the Original Flora. I need a good magnolia too. I would second L’Instant for Magnolia. I don’t know of any other frags with that note – except for the cheap watery supermarket spray. I don’t think I like Gardenia – though the quality of The E.L and the Isabey is clear I don’t really enjoy either. And I’d be interested in some more light fresh tuberose scents! Does anyone have an opinion on the differences between Flora Edp, Flora edt and Flora Eau Fraiche? Another light fresh tuberose: L’Artisan La Chasse. I didn’t try the later concentrations of Flora though, sorry. Givenchy’s Hot Couture is nominally a magnolia fragrance: I haven’t smelled it in years, and it’s probably changed in the interim, and anyway to my nose it was always more like heavily peppered raspberries than anything else. (I liked it.) Maybe someone who’s more familiar with the newest version knows. I haven’t smelled it recently either. I tried them and agree that only the tuberose one reminds of the actual flower they meant to represent. I remember Summer by Kenzo having a nice magnolia note. For gardenia I advice Crystal Noir Versace edp. Tuberose it’s a note I really like, EL tuberose -gardenia and specially Jean Paul Gaultier Fragile edp are favourites! I’m afraid the last one it’s discontinued so time to stock up!! There was also the Kenzo Eau de Fleur de Magnolia, which is probably VERY hard to find at this point. That, and the AdP Magnolia Nobile, are probably the 2 closest to good that I’ve smelled, but I don’t adore either. Mmm haven´t tried those but have a full bottle fo Summer by Kenzo which fullfils my craving for magnolia very well! Thanks for the advice, anyway! Thanks for listing a few magnolia scents:). On the hunt..:D.
I sniffed these and completely agree with your review, Robin. They were all insipid with only the Tuberose having a *bit* of character. For magnolia and gardenia try Hove Perfumes. They do a lovely Gardenia and ‘proper’ Southern Magnolia for about 50USD- I think a 1/2 perfume is 40ish and a 4oz cologne ( which I have found to have good lasting power) for about the same. Also, have to give a shout-out to the cheap and cheerful Sand &Sable- sunny tuberose and gardenia goodness! Oh, interesting — would not be at all surprised if Hove had a decent magnolia especially. I should order some samples, I haven’t tried anything from them in a long time. The original Juicy Couture is a light and pleasant tuberose, and not expensive either I think. yes it is, and I think it also smells of watermelon. The parfum (my drugstore carries the minis, about $13 for 5ml) is *lovely*. The EdP is total Watermelon Bubblicious, and I can’t wear it. OMG – watermelong bubblelicious!! Ha – that takes me back. I remember how big those blocks of gum were. Awesome!! I think it can be found quite cheaply online, too. I’m failing miserably at staying within the price range, but I like the rarely mentioned Penhaligon’s Anthology Collection Gardenia by Duchaufour. It has that interesting blue cheese/slightly indolic gardenia note in the opening, although it softens (maybe too much) after a while, becoming a more generic white floral/musky/vanillic fragrance, though still quite nice. But, like I said, I cheated. The price is too high to qualify! Tom Ford’s Velvet Gardenia anyone? Un Matin d’Orage (Annick Goutal) is a gardenia scent I really like. Airy. Also lovely Gardénia Pétale by Van Cleef & Arples (Collection Extraordinaire). Less airy, softer and sweeter, more traditionally tropical, but not heady. L’Eau Ambrée by Prada has a gardenia note according to the text on the bottle and I seem to catch some gardenia-loveliness in it! Ooh, I second Gardenia Petale… wish it lasted more than a half hour, though, if I’m going to lay down that kind of dough! Gardenia: Tahitian Gardenia by Pacifica. Beautiful, and probably the cheapest out there. The other two: don’t know. I do like Pacifica for a cheap thrill. I think I have seen a collection of 5 flankers? There a mandarin and violet. Haven’t gone around trying them yet but perhaps violet may be a better bet? Yes, the mandarin and violet are not in general distribution though. I don’t have any good suggestions, but I’ve appreciated all those in the comments. I’ve added a bunch to my to-try list. Has anyone mentioned Elizabeth W’s Magnolia? Quite pretty. Nope, I forgot that one! You’re right, it is pretty. For tuberose: Surprised no one mentioned Poison. The current EDT is surprisingly modern and around $70. But seconding Fracas for me. For gardenia-turned-tuberose, EL Private Collection Tuberose Gardenia, or the less loud little sister Jo Malone Vintage Gardenia with a little cardamom kick (not really for me). Magnolia: Kenzo Eau de Fleur de Magnolia; Kenzo has a new one (Fleur de Camelia?) in which magnolia is also featured but I have not seen it anywhere – anyone try this one? I liked JM Vintage Gardenia enough to buy, but it’s really too sweet for me. Great layering scent though! You can get the BK Beyond Love travel refills for $70. It’s only an ounce of perfume but it’s such a joyous tubereuse so that’s a lot of tubereuse happiness! Or you could cheat and buy the new solid perfume compact for $95. Not a bad deal, really! I’m no fan of tuberose, but love magnolia and gardenia – both are hard to find. I second Hove’ and also love i profumi di firenze Magnolia Dolce, though it’s pricey. Forgot to mention I’d tried the Gucci’s this past weekend and was very disappointed. Not even pleasant, to my nose. Sigh. Oh, forgot the iPF — I liked that one too. My husband and I enjoy our little bottle of The Body Shop’s Indian Gardenia oil. I don’t know if they still make it, though. They’ve cut a lot of their older oils — doesn’t look like they have that one. I saw these Gucci Flora flankers on a big promotional stand in Debenhams but I just couldn’t be bothered smelling them. like you said Robin they’re a dissapointment so I don’t think I’ll bother sniffing them. Hey, but it never hurts to try! I am so surprised no one mentioned the original marc jacobs for a gardenia! A full bottle is around $75. I will always have a special place in my heart for this fragrance. When I discovered it 10 years ago or so when I was in college I felt like it made me feel like a real adult and was my gateway to the world of perfumery. Although I have moved on to better gardenias and other white flowers since then, I still think it is a really classic and well done gardenia for a mainstream perfume. Its first flanker (I think) blush was also nice, but I can’t say the same for the releases of late! I’d agree, it was well done. I liked Blush too. Bracing myself against all the hate-orama LOL The Gardenia one is not THAT bad actually. Yeah, it doesn’t smell of gardenia, but it’s yummy and warm. I’m a niche addict, but once in a blue moon, I happen to like a dept store scent and now is that time. Hey, we don’t shun people here! Really glad you like the Gardenia. Thanks, R ! By the way, would it be possible to review Rihanna’s new fragrance, I think it’s called Rebelle? It’s already out at Macy’s, actually it’s been out for a couple of months now. Pretty please? I tried to get a sample but failed…will try again! Violet and Mandarin are indeed exclusive to the Gucci boutiques, in case anyone was wondering.